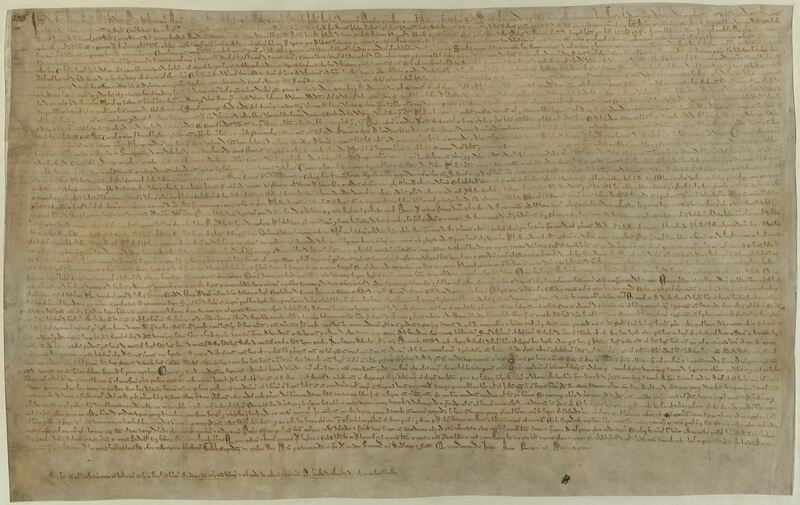 The Magna Carta is roughly 3,500 words long, has 63 clauses, and was written on sheets of vellum (‘calf skin’). It is generally accepted that there are four “engrossments” of the Magna Carta that survive from the year it was originally sealed—that is, from 1215. The Lincoln copy, kept in Lincoln Cathedral in England’s north, is the only one of the 1215 engrossments considered fit for overseas travel. It was kept in Fort Knox, Kentucky during World War II. In 2014-2015, it took another journey across the Atlantic and toured the United States, where it featured in various Magna Carta exhibitions. Another well-preserved engrossment is kept in Salisbury Cathedral in Wiltshire, in the south of England. The remaining two engrossments are kept and displayed in the British Library, London. One of these copies is in legible condition. The other was caught in a fire in the eighteenth century. Unfortunately, restoration attempts in the nineteenth century left most of the text illegible. In addition to these four 1215 engrossments, a number of later editions of the Magna Carta survive from the later thirteenth and early fourteenth centuries, as the document was reissued by later English kings. The Magna Carta displayed in Parliament House, Canberra, dates from 1297, when it was issued by Edward I, John’s grandson.